Starting today, I am instituting “Slow Cooker Saturday” here on The Wilderness Wife Blog featuring helpful slow cooker crock pot recipes and hints and delicious, easy slow cooker crock pot recipes. 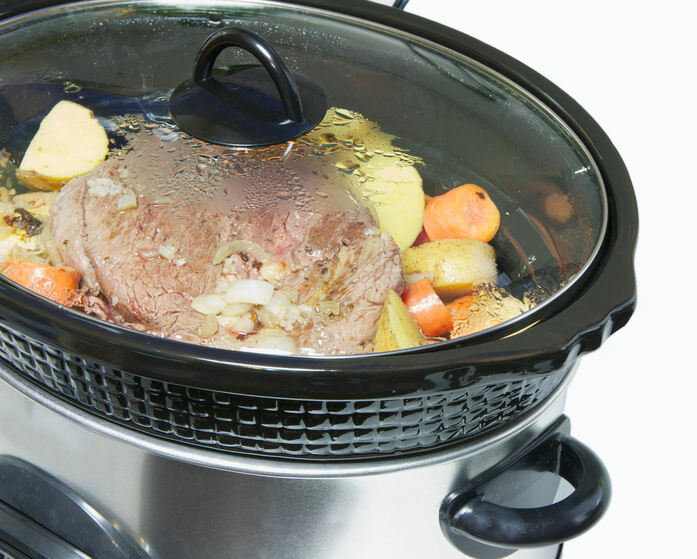 Whether you call it a slow cooker or you call it a crock pot, these are very handy appliances, and in my opinion, are not used enough in today’s kitchen. For years, slow cookers aka crock pots got a bad rap with people believing that they produced mediocre, bland mush but that’s a huge misconception. I love my slow cooker and am always developing slow cooker crock pot recipes because the slow cooker has so many advantages. For a working mom, it provides the opportunity to have a yummy meal ready for the table soon after coming home from work. And because of the busy family of today’s varying schedules, your slow cooker can keep food warm so that family members can eat at different times as their schedules allow. Lots of people think that the slow cooker is a “winter” appliance and push it to the back of the cabinet during the summer. But during the hot summer months, I love using my crock pot for baking bread, cakes, and desserts sparing me the agony of heating up the kitchen on a muggy sweltering day. 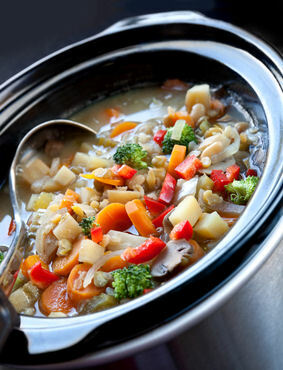 This slow cooker crock pot recipe for vegetable soup, cooks and simmers all day while you are away. Using your slow cooker is economical. I was pleasantly surprised when I found this chart that compares the energy costs of different kitchen appliances on the Nourished Kitchen blog. I had always considered my slow cooker crock pot a money saver as it can take the cheapest, toughest cut of meat and turn it into a tender, tasty delicacy and knowing that it saves a considerable amount of energy costs is just “frosting on the cake”. Recipes for a slow cooker are simple and easy. Most break down to cut up ingredients, put in slow cooker, turn on slow cooker, and set timer, and leave it to do its job. So how can you lose using a slow Cooker when it is economical, time saving, energy saving, and produces delicious penny-wise meals? It’s a win, win for today’s busy families! This slow cooker crock pot recipe for roast beef and vegetable is hearty and delicious, and makes a cheaper cut of roast beef as tender as prime rib. If you have the storage room in your kitchen, have more than one. Sizes range from 1 ½ qts. (nice for hot dips) up to 10.5 qts. I have three – a small 1 ½ qt., a 6 qt., and an 8 ½ qt. Each has its place in my slow cooker repertoire and all three come in handy on holidays. A large oval shape is nice for cooking a whole roasting chicken with vegetables – a complete meal prepared in one pot. 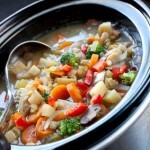 It is important to use the right size slow cooker so it isn’t overflowing or under-filled. If you are only going to have one slow cooker, a 5-6 quart size would be a good choice. Most manufacturers will tell you to fill the slow cooker 2/3 full but refer to your manual and resist the temptation to fill it to the brim. When using your slow cooker, common sense tells you to clear the counter space around it. It is going to get hot, and you are leaving it unattended. I always leave a 6 inch “buffer zone” around it so the heat can dissipate. Resist the urge to check your slow cooker by lifting the lid. Each time you lift the lid heat and moisture escapes and will interrupt the cooking process. Unless the recipe specifically calls for your adding additional ingredients later in the cooking process, “set it and forget it”. Although you can just throw the ingredients in the cooker and go, there is one trick that I use to improve the flavor and appearance of meats if I have a little extra time. I heat a cast iron skillet, put in a tablespoon of olive oil, and sear/ brown the meat before I place it in the cooker. After placing the meat in the slow cooker, I then take the liquid called for in the recipe and use it to “deglaze” the skillet. Then I pour that liquid, which now contains all the caramelized brown morsels from the bottom of the skillet, into the slow cooker. This will add another layer of flavor to the dish. Ground meats should be cooked in a skillet before adding, and be sure to “deglaze” the pan to get all the tasty goodness. Vegetables cook more slowly in a crock pot than meat does. For that reason, I always put the veggies on the bottom where they simmer in the liquid. I then place the meat on top, which allows the drippings from the meat to add extra flavor to the vegetables. Because the crock pot is closed during the cooking process, liquids don’t boil away like they do when cooking on a stove top. If you are using a recipe that wasn’t developed for the crockpot, reduce the liquid called for in the recipe by 1/3 to ½. You don’t have to make this adjustment if you are making a soup but otherwise you should reduce the liquid. If your recipe calls for cayenne pepper or Tabasco sauce, be careful. It is better to add these during the last hour of cooking as they can become very bitter when cooked for a long time. And be very careful with dairy products, adding then during the last ½ hour of cooking, unless your recipe states otherwise. I add my spices during the last hour of cooking as they will lose their flavor if cooked for a long time. If you are cooking seafood, add it during the last hour of cooking as it can become rubbery if cooked too long. And be sure to completely thaw any frozen ingredients before adding them to the slow cooker. 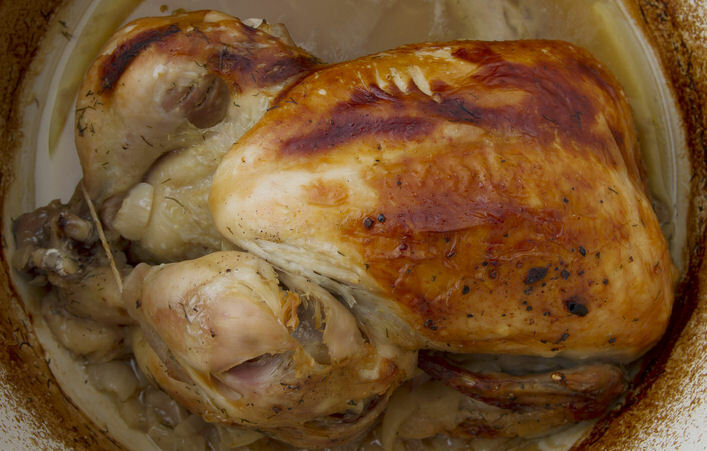 Cooking this whole roast chicken using my Slow Cooker Crock Pot Recipe gives you a moist and tender bird as the centerpiece of your meal. 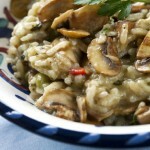 For this recipe, it is easiest if you use a 7 quart or larger slow cooker. I use my 8 1/2 quart slow cooker and have plenty of room. In a small bowl, combine the first 8 ingredients to create a nice spice rub, and rub the spice mixture onto the chicken. Put chicken in a plastic bag and refrigerate overnight. In the morning, take chicken in bag, from fridge and let set on counter for 1/2 – 1 hour. When ready to cook, put quartered onion in the chicken cavity and place diced onion in bottom of slow cooker. Pour in 1/2 cup of white wine. I use a good wine that I would drink with the meal. Add chicken. No liquid other than the wine is needed, the chicken will makes wonderful juicy sauce that can be thickened with a roux and served as a gravy. Cook on low 6-8 hours. Doneness can be checked by inserting a meat thermometer into the thickest part of the breast. 170 – 175F degrees is done. Carefully remove chicken and place on platter to rest for 15 minutes while you use juices from crock pot to make a gravy. i read everyone’s cmoemnts before i attempted this recipe. For all those who need specifics (like i do at times) i used Buttermilk Grands biscuits by Pillsbury. i did cut them in half and I squeezed 14 in there. 13 would have been comfortable but i didn’t know how to cook a ball of biscuit so i just squeezed. i did make extra glaze (i even added 1 tsp of cinnamon sugar in the glaze). i cooked them for about 2h 15m and they were still a little soft, but 2h and 30m was good. My crockpot is fairly new and i did use a liner. they came out beyond fantastically great (my boyfriend ate 9 of the 14) and THANK YOU to the Crock Pot Girl for being awesome and posting this recipe. Just found your site today, very interesting and delightful, I have been a Chef for 50 years, retired now. When I don’t use wine, I use an appropriate broth to deglaze the pan. Getting all the yummy bits of brown goodness from the bottom of a a pan is the goal. This is a very nice recipe, but I think it should be made clear that when cooking chicken this way, no additional liquid is required. The chicken will release a lot of its own liquid as it cooks. If you WANT the additional flavors, then add the liquids, but it turns out really well all by itself. If you are really pressed for time, or didn’t realize until the morning that you wanted to make this, you can just season the chicken with salt and pepper, stick it in the pot and then complete the cooking as directed above. Love this! I regularly crock pot and I’m always on the lookout for new recipes. Thank you! Great hints and I really look forward to this series. I hope you will continue to link up your delicious ideas. 😀 Thanks for sharing. I am definitively getting my crock pot out! Thank you for sharing these tips and delicious recipes at the Thursday Favorite Things hop xo P.S. I’m shining the light on you on Monday! This looks really super good. I’m wondering about an alternative to the white wine. Suggestions? I am not supposed to drink any alcohol. I know it probably burns off – but still – it just doesn’t seem right to me. Wondering if you can just leave it out, or if there is a flavoring that would be similar? Actually there are a number of things that one can use for a substitute for wine in cooking, such as fruit juice and soda pop. I stay away from really sicky-sweet soda like Mountain Dew, but gingerale, root beer, and coke are all good alternatives in cooking. For fruit juices, orange juice or lemonade would be good. Try to choose a liquid that will compliment the meat you are using and add to the depth of flavor. In the case of this recipe, I would use the same amount of gingerale. And it is definitely a good question to ask! Alcohol does not completely burn off in the cooking process as is commonly believed. Although some does, not all! And in the case of the slow cooker, no moisture escapes so all the alcohol will still be there. I love my slow cooker! My mom demo’d them for Litton in the 70’s when they were just hitting the public, and she really only had 1 catastrophic failure: fried chicken. Otherwise, everything she made turned out pretty good. I love using mine for ingredients too (caramelized onions, recipe at Shockingly Delicious) and this summer I’ll try pizza in my largest one. I didn’t know you could slow roast a whole chicken. Isn’t that silly that I didn’t know? What a great, easy idea. Yum! Thanks for the great tips! Thanks for sharing at The Gunny Sack! It is so amazing what it does to the meat connective tissue. I have cooked beef roasts in the slow cooker that would be like an old rubber boot and they fall apart when you go to cut them. The slow cooker is excellent for pulled pork! Just delish! This looks delicious! Would love to have you share at my link party this week. Great helpful hints! I found you linked up at Monday Funday and I would love for you to check out my blog! I just posted a homemade (and gluten free) thin mint recipe! I have two slow cookers. One is a crock pot; one isn’t. I’ll be interested to see what else you do with yours. Great tips! I love my slow cooker, but there is a method to the madness! Thanks for sharing at Church Supper. Love seeing new faces. Have a blessed week & come back soon. I enjoyed blog when I stopped in…informative and refreshing! Looks yummy! I pinned this one to try. It is delicious, moist, and tender! You won’t regret it.